A twisting gorge with ancient rock pools and water-worn boulders purveys the banks of the Doring River, which runs through the valley, here the Bushmen painters left evidence of their lives thousands of years ago; lived in harmony with the environment and enjoyed the unspoilt surroundings in Peace. The paintings, pieces of pottery and ostrich shell beads are among the few remnants of their rich heritage. 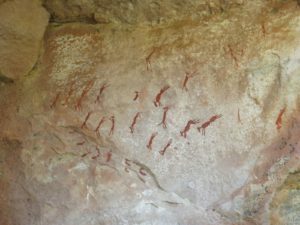 These paintings make up the largest open air art galleries in the world, the san rock art dates up to approximately 4000 years old. We have restricted access to exceptional rock art sites on neighbouring farms, some of national importance, and many more can be explored further afield. 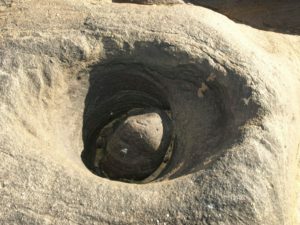 We do guided walks and drives to rock art sites that will suit any level of enthusiasm. 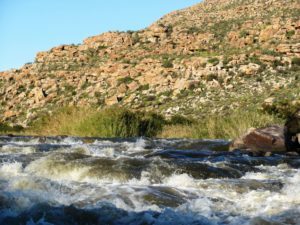 This wide river valley was sculpted by the Great Karoo River millions of years ago, remnants of it seen is the vegetation and diamonds deposited on the West Coast. Across the Central Building (Boma) if you look carefully you can make out the Ou-drif (river crossing) used in colonial times as the “drif” or ford, which was crossed on the trek tothe town. Settlers paused here, leaving a few remains in the form of foundations of old ovens and shards of blue porcelain. Where the Doring River valley had offered water, hunting and fishing grounds to the original inhabitants of this site, it now provided an opportunity for the settlers to wrestle a meagre living. Goats, sheep, wheat, potatoes and fodder crops were raised in the delicate environment situated between the Swartland wheat lands and the arid Karoo veld. Eventually however, the high summer temperatures and the remoteness of the valley made viable farming difficult to maintain. From about sixty years ago Oudrif farm was used largely for grazing with no permanent residents until it was revitalised as a unique experience in guest accommodation in 2000.